Make sure the dates for POST-EXPO Latin America 2013 are in your diary! 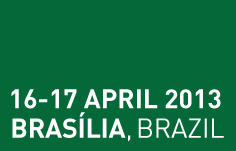 As an independent world-leading platform for the postal and parcel industries, POST-EXPO Latin America in Brasília will be the place to hear about the latest projects and industry trends and developments, see technology in action and catch up on the latest views of industry influencers. It is an opportunity to make informed purchasing decisions, and be one step ahead of the competition. Meet the people who lead the postal industry: With the exhibition, conferences, lunches and receptions it is important to make the most of your time. With expert postal, mailing and express logistics professionals gathering in one place, this will be the most important networking opportunity and building block of the year. Find new business opportunities and revenue streams: POST-EXPO Latin America will provide an excellent opportunity to see new ideas, innovations and technology that can help you provide new services and solutions for your customers. The conference sessions will give you the chance to hear how the industry is changing and developing for the future. The exhibition provides you with a unique opportunity to meet new companies and see technology and solutions that have not been presented before.